The European Aviation Safety Agency (EASA) issued on 30 September 2014 the type certificate of the Airbus A350-900. Airbus demonstrated that the aircraft complies with the regulatory safety and environment requirements defined by EASA for the European Union. Every new type of aircraft needs to obtain a type certificate before it can be delivered to an airline. This EASA certificate guarantees that the A350-900 is set for delivery from a safety and environment point of view. 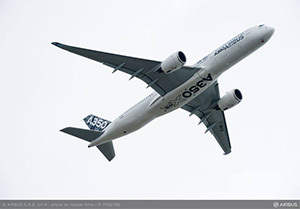 The Airbus A350-900 is the first Airbus passenger aircraft with a new design to be entirely certified by EASA, from the application by Airbus in 2007 until the type certification. When handing over EASA type certificate to Airbus, Patrick Ky, EASA Executive Director said: "We dealt with a very mature aircraft. Airbus and EASA have learnt from experience and have established pragmatic working methods which have proved to be the recipe for the successful type certification and the way forward for future certification programmes. I wish a long and safe journey to the A350 programme throughout its life in service". During the certification programme, EASA has established 16 technical panels composed of 40 engineers and test pilots, covering the full range of the programme from structure to avionics and from cabin safety to flight tests. EASA flight test teams have actively participated in more than 250 hours of flight testing. Nearly 700 certification documents were reviewed and accepted by EASA. More than 60,000 hours were logged by EASA staff or experts from European National Aviation Authorities to enable the certification of the A350. The Airbus A350-900 can carry 315 passengers over a distance of 7,750 nautical miles (14,500 km). Its in-service safety record will now be monitored by Airbus and EASA through continued airworthiness activities.